Types of shepherd dogs, which are variations of, similar to and/or often confused with the German Shepherd Dog. 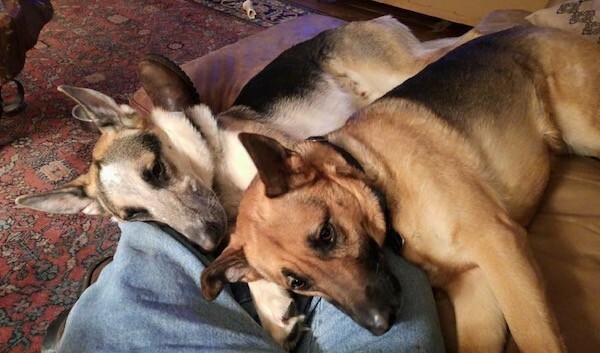 Benny the tricolor Panda Shepherd with Mabry the black and tan German Shepherd. "This is Shady (left) and Nikki (right). 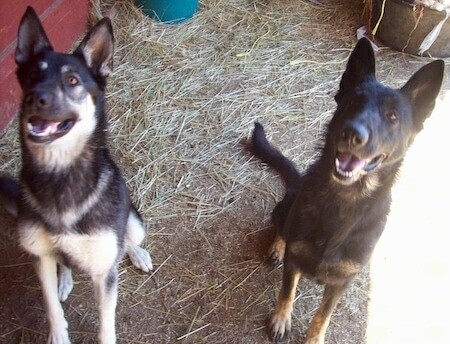 They are both German Shepherds. Shady is 2 years old in this photo, has an aggression problem toward other dogs, but loves rubbing on me an slepping under the sheets with me. I rescued Nikki. She is 3 years old in this picture and is still skinny. She is very sweet and loves everyone and everything, she barks a lot. They are let out early in the morning and they run around my 4 acres. They are let in at dinner time. I love them and they mean everything to me!"